We’ve seen it so often in Hollywood blockbusters. The rich husband drops a bomb on his (usually much younger) wife just before she is to make it down the aisle. The words “I think we should get a prenup”, are usually followed by tears, hysteria and in worst cases a slap across a freshly-shaven face. 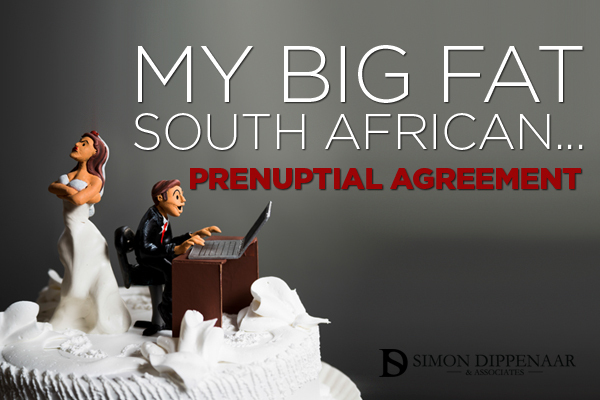 Prenuptial agreements, more commonly referred to as antenupetial contracts in South Africa, is a contract signed between couples before they get married. Hollywood would have us believe that prenups are designed to protect only one person participating in the marriage, but in actual fact it’s about protecting both people from potential future risks. There are two types of antenuptial contracts. Insolvency is a very scary reality in the current economic state. Should your spouse be declared insolvent you are protected from any creditors. Both partners are legally obliged to offer one another financial support, should one partner not be able to support him or herself. In the unfortunate event of death or divorce you are only entitled to those assets you have accrued. Before the marriage, the couple lists assets they want excluded from the accrual. Once married, any assets accumulated are shared 50/50. Each partner remains financially independent. This agreement is ideal if one partner chooses to be a homemaker. If you get married without signing a specially prepared contract you will automatically be married in community of property. Which means you share any and all assets and risks accumulated before and after marriage. In the midst of planning details from dresses to table settings and everything in-between for your special day, legal requirements and considerations more often than not take a back seat. Fortunately, the regime of your marriage can be changed once you’ve said I do. Contact us SD Law & Associates if you would like us to draw up or review your antenuptial contract. Or if you would like to have the marital regime of your marriage changed. For more about marriage and insolvency click here. This entry was posted in Prenuptial and tagged Prenuptial Agreements. Bookmark the permalink.